The big block Chevy power plant with a kit long-block that was relocated rearward to match the extreme setback used in the actual car. 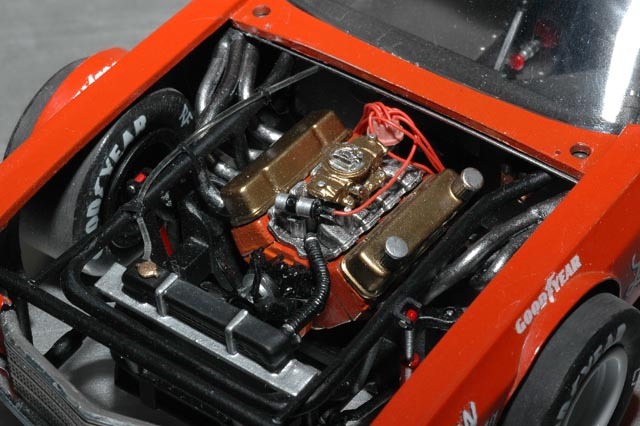 This is topped with an intake manifold from a NASCAR kit, and an aftermarket carburetor, valve covers, coil, and distributor from Fred's Resin Workshop. Using solder and plastic tubing, Tom scratch-built scale replicas of the boat headers that Bivins used to the discontent of his competitors. To see more of Tom's model (including body-off shots) and read a more in depth article about the Terry Bivins Monte Carlo, check out http://www.ovaltrackmodels.com/tf53.htm.